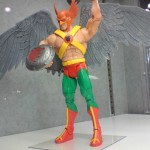 Just in from the 2009 New York Comic Con are new Mattel DC Universe toy images! Click the thumbnail to check them all out. Included are pics of Superman, the Flash, Batman vs Clayface, Gentleman Ghost, Hawkman, Big Barda, Mr. Miracle, Giganta, Captain Cold, Mr. Terrific, Kalibak, and more! This story has been updated with more images as of 3:42 PM.